Is "Alli" The Holy Grail For Dieters? It's only half as powerful as its prescription-strength predecessor, but the new fat-blocking drug Alli (pronounced "ally") is creating a serious buzz among dieters. 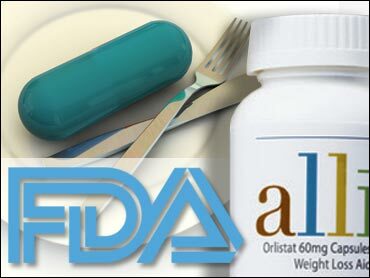 The first over-the-counter weight-loss pill approved by the FDA, Alli works by blocking about one-fourth of consumed fat. The drug's makers don't claim that it's a miracle drug — a reduced-calorie, low-fat diet and regular exercise are necessary companions for it to be effective — but dieters are eager to reap its potential rewards. In Southern California, where constant dieting is a way of life for many, it hasn't taken long for Alli to catch on. When the drug hit the shelves at a Santa Monica pharmacy on Thursday, all but one box was sold within four hours, the Los Angeles Times reported. "I have never in my life experienced anything like this," store manager Roe Love, a pharmacist for 20 years, told the paper. Most of the buyers so far have been women drawn by the promise that Alli will help them lose 50 percent more weight for the same effort than traditional diet and exercise plans. Alli users must contend with some less-than-glamorous side effects — gas, oily discharge and an inability to control bowel movements — and skeptics of the pill's enduring benefits point out that those aren't the only reasons to think twice before taking the drug. "There are demonstrable short-term risks and no possibility of long-term benefit," Sidney Wolfe, MD, director of Public Citizen's Health Research Group in Washington, told WebMD. "You need to make a mild change in how much you eat and a mild change on how much you exercise. If you walk 2 miles more and eat 300 calories less per day, you will lose a pound a week or one-half a pound a week. It's slow but it works and has no risks." But that advice isn't likely to dissuade serial dieters who are looking for a less grueling way to lose more weight. "You have to be careless to use Alli incorrectly, but some people are careless," Arthur Frank, M.D., the medical director of the George Washington University Weight Management Program in Washington, told Web MD. "If you are reasonably careful, it should be reasonably effective."